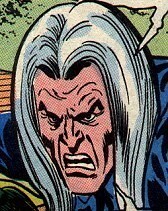 The inimitable Andy Rush (a.k.a. 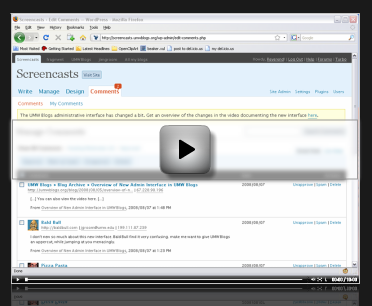 EduRush) and I have been working diligently to create a whole slew of screencasts documenting the new interface for WPMu 2.6. We’ve finished a whole bunch of them over the last week or so and published them on the now official UMW Blogs Screencasts site, so below is a list of the ones we have created. They’re all under a Creative Commons license, and while they’re currently published as SWF files, we will be uploading them all to Blip shortly. 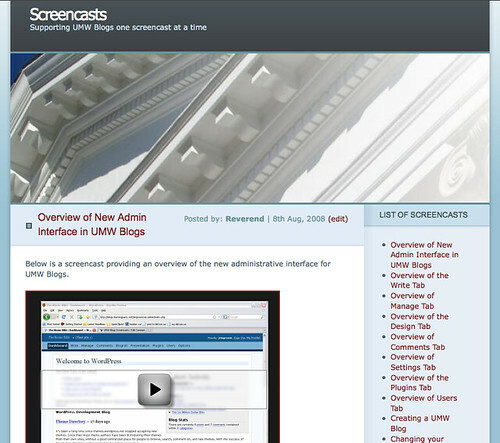 Keep in mind that these screencasts are specific to the UMW Blogs installation, but they still may prove useful for anyone who wants to point people to a quick overview of the administrative backend, the changes between versions WPMu 1.3.3 and 2.6, and a very tab-specific discussion of the how to manage a WordPress blog. Now the difference between Andy’s screencasts and mine are easily discernible: he is the consummate professional and I’m the consummate hack. Andy’s are brief, no-nonsense, and precise poems, whereas mine are meandering, overly long, fraught with missteps, and bad jokes (the Overview of the Comments tab is an excellent example of this). That openly acknowledged, I really enjoyed this process because it forced me to approach this application, which I’ve inhabited deeply for almost two years, from the perspective of a novice. What I discovered along the way are some issues that I need to focus on to make UMW Blogs that much easier. For example, I expected the screencast that provides an overview of the Design Tab to be straightforward and simple, yet I found that working with a wide array of themes, widgets, plugins, and dsader’s Userthemes is not always as simple as I preach. Take the fact that if someone changes the theme, they may lose the Meta login sidebar element that could totally throw off someone who is not familiar with the application. Additionally, while DSader’s Userthemes Revisited plugin is a huge asset for UMW Blogs and I love that he has developed it out, it also presents a potential difficulty for users. 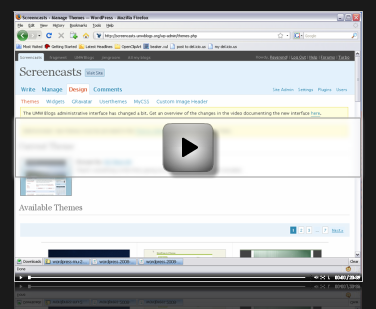 Specifically because Userthemes shows up in the Design tab for everyone and anyone that has their own blog. And while only people who are enabled by an admin can hack their theme, anyone can still activate Userthemes and effectively lose the functionality of the built-in theme viewer. This could potentially confuse someone who activates a theme through Userthemes, and then deletes that theme and returns to the theme viewer they won’t see anything at all. What happens is that the system themes have effectively been disabled. It would be nice if when a user deleted a (or all) themes activated through the Userthemes subtab that they could once again access the system theme through the themes subtab. (This has all been fixed in the revisited version which DSader had told me about and I thought I had upgraded to, but alas I was wrong as usual –the plugin is fully loaded now!). Additionally, the relationships between sidebar widgets and plugins in WordPress is not as clear as it could be. When new users activate a plugin they often have to know to go into the Settings tab to configure the plugin and, quite often also need to drag a plugin-specific widget into the sidebar for the functionality to appear on the site. Now don’t get me wrong, I love the fact that WordPress demands that users explore the possibilities by providing them a place to experiment and play with the application. And I wouldn’t sacrifice that for a clean experience by any means. That said, these screencasts helped me see some of the obstacles I had been overlooking for people who are coming to this application fresh, and I have to start working on ways to keep the possibilities all the features it provides while making the interface rabbit holes hard to fall down. This entry was posted in WordPress, wordpress multi-user, wpmu and tagged screencasts, umwblogs, WordPress 2.6, wpmu, wpmued. Bookmark the permalink. You guys are Rock Stars for the work you are doing, and for making it available. RE: “these screencasts helped me see some of the obstacles I had been overlooking for people who are coming to this application fresh” — amen to that. One of the beautiful things about creating documentation is that you can see where the user gets bogged down — it’s usually exactly the same place where you (the docs writer) struggle with how to organize/explain the process. Thanks for this — it’s a great resource. Why thank you, we learn from the best of the open folks like yourself. And I have to say that going through each tab on the backend of UMW Blogs was an important process for me getting to think about the interface. It was a necessary labor to remind myself of the fact that this stuff isn’t necessarily as easy and intuitive as I sometimes believe. More than that, the narrative bumps which I kept in the screencasts) suggest the idea you point out here beautifully, my own issues with telling the story mark the spaces in the interface that need to be worked on, or at least explained more clearly. Doing these screencasts in the rough, as I have, has been really important for tracing where this application exceeds, and where it doesn’t. The version of Userthemes you’ve demonstrated was the pre wpmu2.6 version(clearly unstable in wpmu2.6). The “Revisited” version is much better with 2.6 and fixes major annoyances you’ve pointed out. It is only active for enabled blogs, the Regular themes list is filtered properly. An active usertheme can’t be deleted until a user manually activates a System theme . . . avoiding the broken theme phenom. You will be satisfied with the Revisted version, go ahead and upgrade the plugin ASAP. Keep in mind, anyone with Userthemes enabled will have access to the theme-editor, use extreme caution granting access to theme-editor… Malicious or the absent-minded can destroy your entire WPMU database, evan a seemingly simple typo can cause php/apache to “core dump” till your entire machine goes down. Not fun. I upgraded to the latest version and it answers my every prayer 🙂 hanks for this awesome plugin, and now it can be shown/hidden as need be, which makes a huge difference. Sorry I blogged this before trying the new version, I musn’t have had it installed on UMW Blogs, so that’s my bad. Also, I appreciate the warning about editing themes, I know there’s risk involved, but we have a pretty tight leash over who can, and who cannot edit these themes. So, in the end, I am not too concerned about the risks, though I guess this is why backups come in handy.